Toronto’s Trailblazing Women tours this year. I am happy to have been accepted again this year. And the weather is finally getting warmer so I can start to use my ‘outside studios’ to do sanding, drilling and gluing. The Fair takes place at Nathan Phillips Square in downtown Toronto. Free. Rain or shine. Stay tuned for more details in June. I have purchased quite a few used huipiles (women’s blouses/shirts) over the past few years, mostly from a store in Antigua, a lovely old colonial city about 45 minutes away from Guatemala City. The store has a huge pile of old huipiles that I go through each time I’m in Guatemala; I’m always searching for treasures. On my recent trip I started looking also at the insides of the huipiles to see the weavings’ backsides. A lot have little thread ends all over from small coloured sections, woven in or hand-embroidered. They reminded me of the wires I use these days….so I am going to work on combining wires and textiles in the next little while. I love working with wires, but very much miss the textures of textiles. This will be my 3rd year participating in the Hills of Erin Studio Tour. For the first time, I and my twelve fellow local artists will all be showing our work at the Teak Barn, 8K west of Erin, Ontario. Come check out what we have been creating this year!!! Enjoyed the show! Good feedback, interesting chats, and sold a few pieces..
Big thanks to Wally, Michelle and Deni for your help....I couldn't have done it without you. July 6 - 8, 2018 - Nathan Phillips Square - FREE - Rain or Shine! The Toronto Outdoor Art Exhibition is open to the public and free of charge. Artists will be available at their booth spaces for you to see, experience, and purchase their original artworks during the following hours. Our Cascading Beer Garden by Henderson Brewing Co. is open throughout the day for food, beer and refreshments! Second year that Everdale has been part of Doors Open Erin, and that I have been one of the artists at Everdale. Hoping for good weather! I found out yesterday that I have been accepted into this show, so now it is full steam ahead to prepare. I participated in this show several times in the 90's, and most recently in 2008 and 2009. I am delighted to be there again with my new series of works using computer/electronic cable wires. 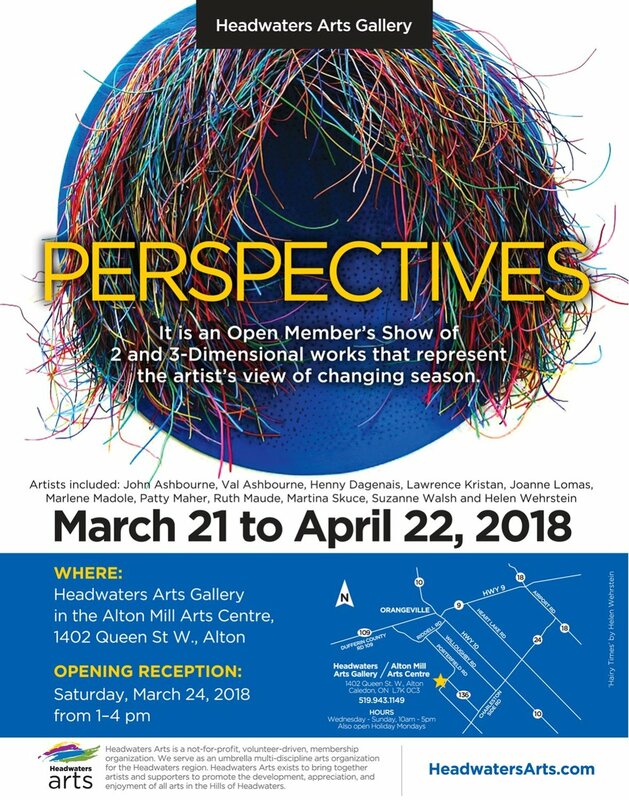 I am excited to be one of the artists in this show. I will have 5 pieces from my Hairy Times series there. Hope some of you can join me there for the reception Saturday Mar24 1-4pm! The official promo will be coming soon. For the past couple of weeks I have been preparing the photographs I took of my recent work. I'm learning more and more about Photoshop Elements, the photo software I use. It may be Photoshop light, but it has lots to offer and I am enjoying exploring this digital darkroom. Check out the RECENT WORK page to see the images of my new work, just posted. Hills of Erin Studio Tour ~ THANKS!! Thanks to the folks who visited my Everdale studio during the Hills of Erin Studio Tour, especially those who braved very hot weather on the second weekend. I loved talking with you all. And thanks to my dear friends who helped me out. You're the best! The Brochure is out now, with all artists listed and a map. I'm taking time out from gluing wires to do a little promo! Part of Doors Open Erin, this was a new art/food event at Everdale, Hillsburgh. It was a wonderful day! A bonus: I got to spend time with some of the local artists who I met last year as part of the Hills of Erin Studio Tour. Now it's time to prepare for the Hills of Erin Studio Tour! Now that spring is here and the weather is warm enough to work outside, I have started sanding and drilling wood bases for some new works, in preparation for EVERLOCAL in June and the Studio Tour in September. This year all the sawing, and some of the heavy sanding, has been done at the Danforth wood workshop of the Toronto Tool Library, a fantastic organization. I have to make tough decisions now about how to divide my time between art making and gardening at Everdale. The HomeAlive! garden needs a lot of work too!! Come and enjoy some time at our farm.....Great food produced and prepared by our farmers and farmer interns (until noon).....Beautiful art/craft work shown by myself and Karen Brown, Colleen Darrell, Beth Campbell, Beth Grant, Nancy Ladner, Jennifer McKinnon, Heather Nagel. I like working with wood....a nice antidote to the plastic and metal found in deconstructed devices. I do have some of my own tools, but I have found 2 places where I can make wooden discs for new works, frames, etc with more sophisticated tools, and guidance. I will be checking them out this next week: Site3 CoLaboratory and The Tool Library in Toronto. Both have a set of tools that can be accessed by members or guests....cooperative ventures, so smart!